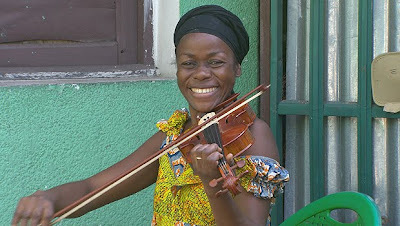 From last night's 60 Minutes: Joy in the Congo. I've never watched 60 Minutes before, but a student's mom mentioned this segment to me today and I looked it up online to watch it. I'm so glad I did. The story of this orchestra is incredible -- a symphony orchestra in the Congo that plays Western classical music with tremendous enthusiasm and dedication. Next time I feel like complaining because I "have to go to a rehearsal," I will remind myself of these people, who walk 90 minutes each way to rehearsals almost daily because they want so much to participate in the joy of making music.